Most of the new windows PC or Laptops comes with lots of pre-installed applications. These could include applications like DVD/CD burners, Toolbars, Gallery, Media Centers, Games, Utilities and all. Some of them are useful and some of them are crap and take most of the space on your Windows Drive and slow the performance of your windows PC. You can uninstall all these application easily from the Control panel feature of the Windows Machine, but It doesn’t tell you what a program does and which of them are useful. 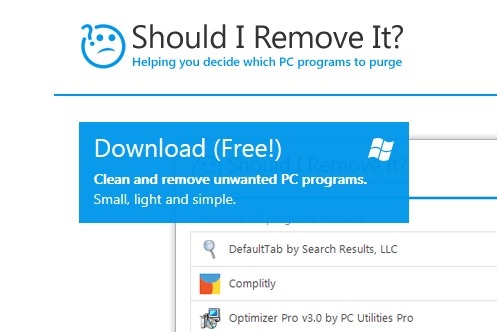 Today, In this guide we’ll show you a small tool called Should I Remove It?, which allows you to scans your computer for all its’ installed programs and let you know which of them are good to remove and how many Should I Remove It users uninstalled that particular program. This program is helpful to all those user who recently bought the new PC or laptop. All these new machines are full of Bloatware and trialware applications. Let’s take a look how to app works on the PC and how to uninstall the unwanted app form the new computers. 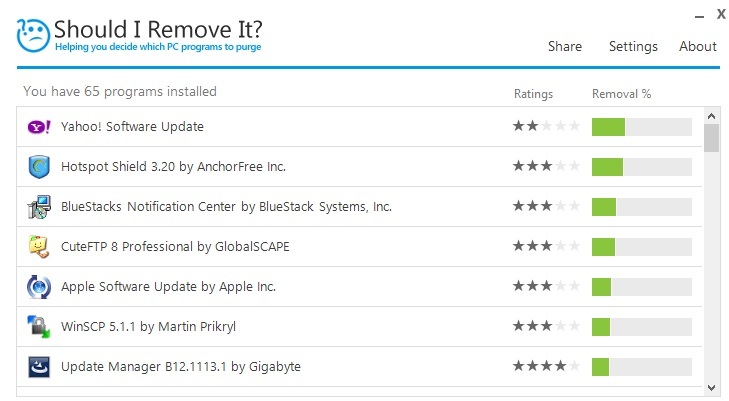 In the list you will see all the apps which are installed on your PC, Click any of the app from the list and you will see the rating of the app and how many percentage users removed the app from their windows PC. If you don’t know what the app does and want to know more about the application, then click on the “What is it” Button from the list and this will open a new page on your browser window and will provide you all the details of the app about what that PC utility you recently installed actually does. 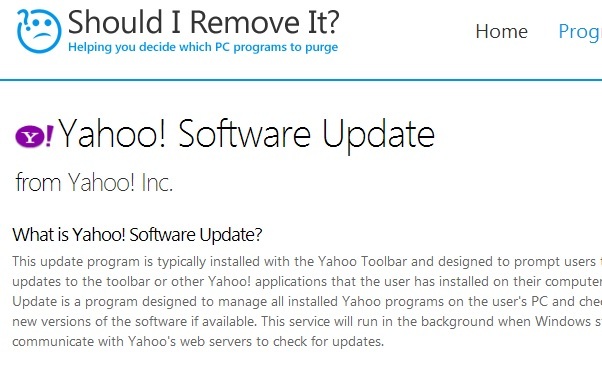 Once you decide to remove a program, you can uninstall it directly inside from the application screen, just click on the uninstall button and the app will remove the selected apps from your Windows PC. One of the best way to find all the unwanted and crap apps on the PC.